E-commerce is more than just the digital marketplace for your online business’s product or service, it serves as the online store for all audiences to reach your company. You can access your e-commerce site’s data in Google Analytics to target audiences’ behavior and improve users’ interaction on your site. But how do e-commerce businesses use this information to attract potential customers and lead them to make purchases? Worldwide, over 2.14 billion people are expected to buy their goods and services online by 2021. E-commerce has a large potential customer base to cater to, so learn how to maximize your business’s sales and profitability. We’ll guide you through the 5 stages of the e-commerce conversion funnel that can help transform your target audience into interested and returning customers. Although most sales funnels or conversion funnels depict four stages, this one shows five. The main difference is that after the conversion step (sometimes called the action stage), there is another stage: re-engage. At each step, there are many ways you can interact with your potential customers to get them to the next stage. In this post, we’ll discuss the marketing strategy for each stage. Before a potential customer can make a purchase, they must know your company exists. The first stage in the conversion funnel is getting potential consumers to recognize your brand. A great way to increase brand awareness is through product listings. 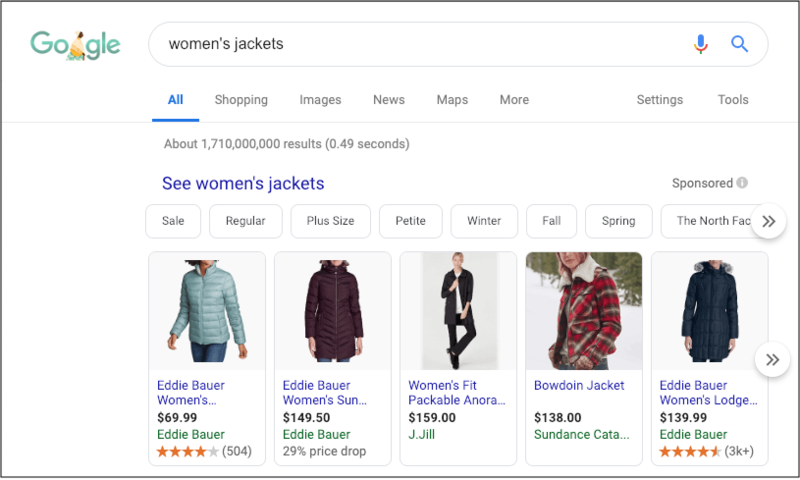 Using Google’s shopping ads, you can automate a visual image and product details to appear at the top of search results on Google and its Search Partners. These ads can appear on the Display Network or occasionally on the right side of a computer screen on the Search Network. The visual of these ads will stand out, making the user see what sets your product apart from the other products and companies. After a potential customer knows about your brand, get them interested in your products. At this stage, your advertisement has made an impression valuable enough to your target audience for them to visit your site and browse through your content. Is your site optimized for SEO and mobile friendly? Get potential users to your site using SEO and paid search ads. Once users click on your site, lead them to compelling content on your landing page and individual product pages. If you have a newsletter or mailing list, get website visitors to subscribe. This part of the funnel is all about getting potential customers interested in the products you have to offer. At this point, the potential customer already knows about your brand and the products you have to offer. This stage is all about making them want to buy what you’re selling. A great way to remind potential customers about your products is through social media. With Facebook ads, you can use dynamic ads, upload a catalog of your products, and target customers who have visited your site or mobile app before. Consumers are 4 times more likely to be encouraged rather than discouraged to buy something if they see a relevant ad during their online search, meaning all the more reason to utilize targeted ads to help build demand for your company’s product or service. When it comes to maximizing conversions, you want your customers to have a great experience on your site. Make sure that your site has a seamless process of exploring product pages, adding items to the shopping cart, and checking out. Creating a great user experience for your potential customers will drive them to conversion, but a bad user experience could frustrate them and even prevent them from returning to your site or making a purchase at all. On average, 70% of customers abandon their carts, so try to make the checkout process as smooth as possible for your users to commit to their purchase. Once your company succeeds in converting a new customer, don’t stop there. Send the new customer reminders to subscribe to your newsletters and follow you on social media. Then, follow up with promotions to keep them coming back. Using dynamic retargeting, which shows ads to potential customers who visited your site but did not complete a purchase, you can remind them about the items they saw. A study found that retargeting led to a lift of 1,046% in trademark search. If you’re trying to achieve repeat customers and create loyalty within your market niche, re-engaging your audience is the way to go when optimizing your e-commerce business. If you’re ready to bring your store online or increase your exposure as an e-commerce business, drop us a note so we can help maximize your sales and profitability.